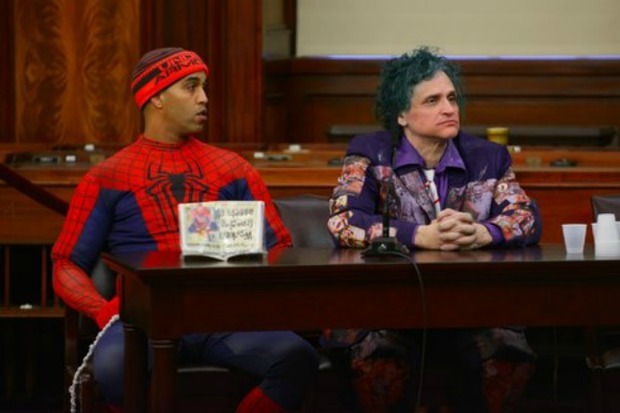 Spider-Man impersonator Abdel Amine Elkhezzani and The Joker Keith Albahae testify at a City Council hearing in March 2016. MANHATTAN — A Times Square Spider-Man who hit the city with a $2.5 million lawsuit last year has filed another suit claiming he was falsely arrested and assaulted while dressed as a pot plant at the Crossroads of the World. Abdel Amine Elkhezzani, 37, was walking from West 46th Street to West 47th Street around 6:30 p.m. on Feb. 23 dressed as a marijuana plant, when he was “harangued, harassed handcuffed and arrested, then assaulted and thrown to the ground” by police, according to a lawsuit filed against the city and the Times Square Alliance in Manhattan Supreme Court Friday. The costumed character, who suffered a cut to his forehead during the incident, was “bleeding and in pain,” but was taken to the Midtown North Precinct to get photographed and fingerprinted before being taken to Mount Sinai West for treatment, the suit says. After his stop at the hospital, Elkhezzani claims he was taken to central booking, but the department wouldn’t accept him because of his “physical complaints." He was ultimately held in a central booking area reserved for “special cases” until 11 p.m. the next day and “maliciously prosecuted” after that, the suit says. Elkhezzani alleges in the suit that he didn’t do anything illegal prior to his arrest. A complaint filed with the Manhattan District Attorney's office confirmed that an NYPD officer arrested Elkhezzani on Feb. 23, but didn't say what the performer was cuffed for. At the time of the arrest, Elkhezzani started flailing his arms, twisted away from the officer and refused to put his hands behind his back before falling to the ground and putting his hands under his body, the DA's office said. A struggle ensued when that officer and a second officer tried to handcuff Elkhezzani, and the second officer fell to the ground, tearing ligaments in his shoulder, according to the complaint. The performer was charged with two counts of assault in the third degree, one count of assault in the second degree, one count of resisting arrest and one count of disorderly conduct following the incident, the complaint said. The count of assault in the second degree was later dismissed, and Elkhezzani is expected to appear in court for the other charges on Nov. 21, the DA's office said. The performer's lawsuit claims police falsely arrested and imprisoned him at the behest of the Times Square Alliance. The costumed character “suffered severe mental anguish and psychological trauma” as a result of the arrest, and is seeking unspecified damages, according to the suit. A spokesman for the city's Law Department on Tuesday said it will review the lawsuit. The Times Square Alliance declined to comment. The action comes less than a year after Elkhezzani filed another suit claiming he was falsely arrested while dressed up as Spider-Man in front of the former Times Square Toys R Us building. Last spring, he was one of a small group of costumed characters who testified against the city’s plans to restrict their activity to designated zones in Times Square. Elkhezzani couldn’t be reached for comment Tuesday, and his attorneys didn’t immediately respond to requests for comment.